The King looms over us all. Sitting high in the saddle, his brow crowned with laurels bestowed by cherubim, he surveys his dominion from beyond the grave. 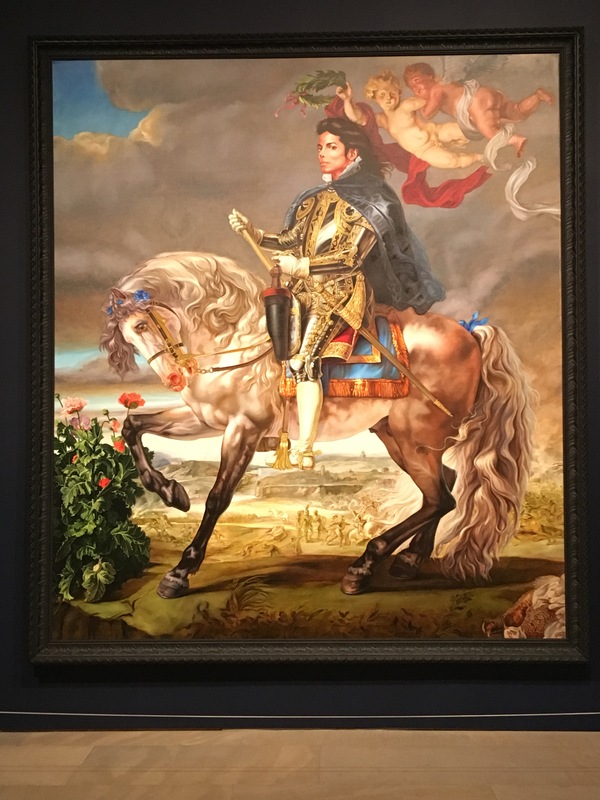 Michael Jackson, King of Pop, immortalized in a court portrait that stretches from floor to ceiling at the Phoenix Art Museum. 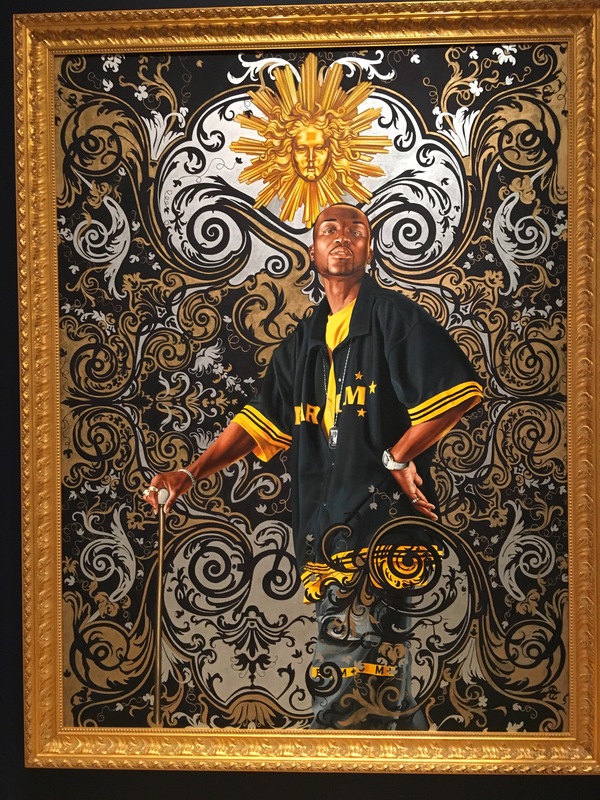 The King is the first thing I saw when I entered A New Republic, the special Kehinde Wiley exhibition on display at PAM from October 7th until January 8th. It makes sense that he’s the first face you see at A New Republic, an exhibition devoted to a subversive take on classical court portraiture: The man himself was royalty, after all. Not the kind of royalty that’s acknowledged via birthright or treaty, but the kind of royalty that’s fueled entirely by willpower, by a will so strong it warps reality itself into acknowledging its legitimacy. His kin are men like Emperor Joshua Norton of San Francisco: Monarchs empowered not by inbred genes, but by world-conquering self-delusion. The rest of Wiley’s subjects come from all over the world, from inner cities and townships to favelas and beaches and beyond. They may not be royalty, either, in the sense of bloodlines or Kanye-sized egos, but Wiley paints them as if they were. Getting his models to select old court pictures that speak to them, he paints them in those same poses and settings while leaving in their modern clothing and brands. Basketball shoes and designer sneakers hang in warhorse stirrups, camo-print Biggie Smalls-style jackets share frame space with falcons and hunting dogs, ceremonial swords get waved by wrists dripping with jewelry and luxury watches. One of the reasons why pictures of Wiley’s work doesn’t do them justice is that you miss out on the scale of these things. Put it bluntly: These motherfuckers are HUGE. Most of the pieces on display at “A New Republic” take up a lot of real estate. It’s not just that these pictures depict regal subjects: They seem to be designed to be hung only in regal places. Even if you could afford a Wiley, could you imagine having one in your home? These things are palace-sized, built to hang in pop star mansions. They’re not meant for apartments, or houses with room-mates who like having free wall space, or in the homes of anyone who’s ever appeared in one of these paintings. Except for MJ, though. Had His Majesty lived, it’s not hard to imagine Wiley’s portrait of him as King Philip II hanging in a place of honor at Neverland Ranch. Most of the exhibition focuses on Wiley’s paintings. There’s a video art installation and some sculptures, but they didn’t leave much of an impression. 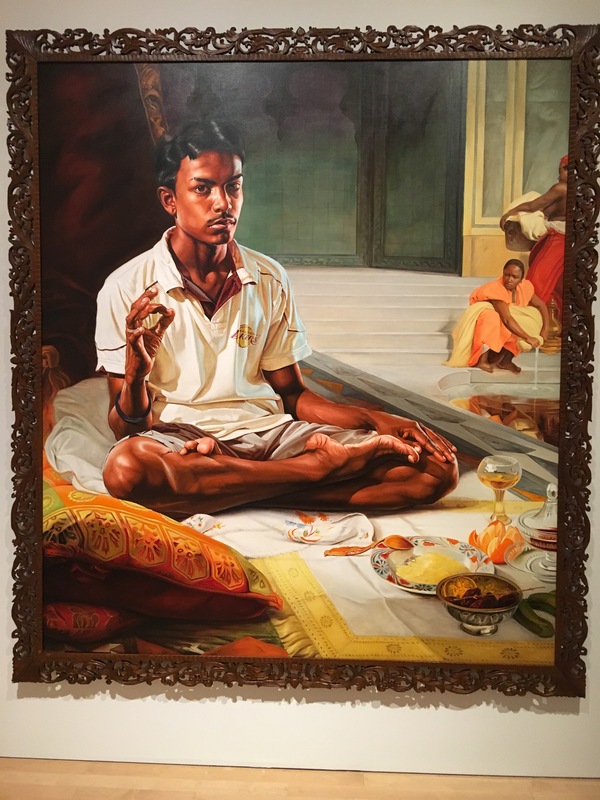 The one area that deviates away from the court paintings that captured my attention was his religious art. 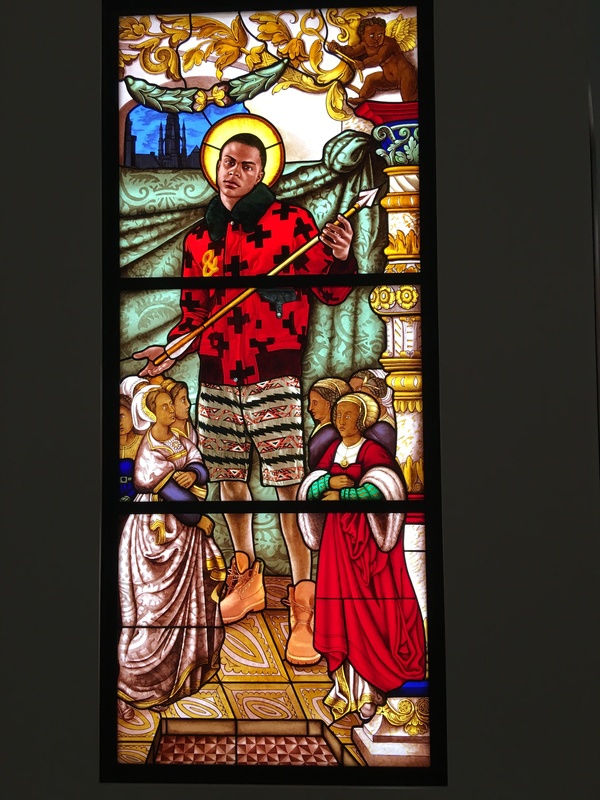 He has some stained glass pieces that are truly impressive. The way he paints the clothes on his subjects is so tactile and vivid- I could imagine reaching out and feeling the fabric on their jackets. 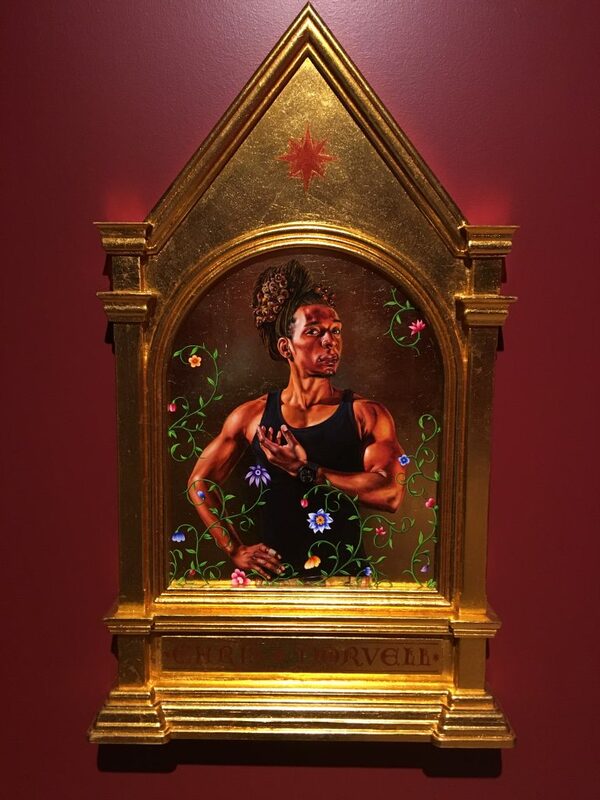 He also has a series of small gold leaf and wood panel icons that offered a nice change of pace from the giants on display outside the icon rooms. When it comes to his subjects, his eye for detail is remarkable. He paints hair and clothes in a way that makes them look so real it’s uncanny. 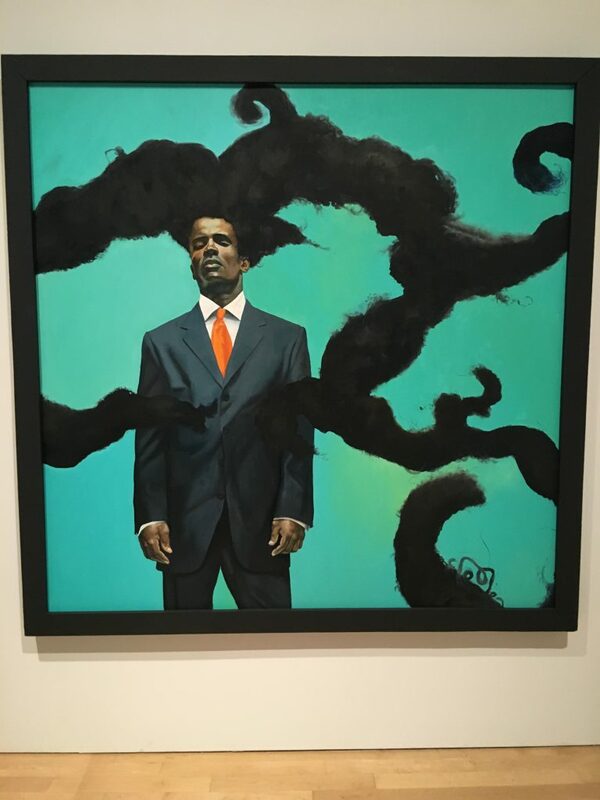 Even in paintings where the subject’s hair is unhinged and whipping around the frame like tendrils of smoke or black tentacles, it looks so authentic and lifelike that you could cut off a lock of it if it popped through the canvas. This talent for detail is really noticeable with his female portraits. His female subjects tend to have cartoonier backdrops than his male subjects (who take up the majority of the wall space), so their lifelike qualities only become more pronounced and noticeable. Speaking of backdrops: That was one of the things that really struck me while I was looking at the paintings. The level of detail in the subject’s environments was staggering. 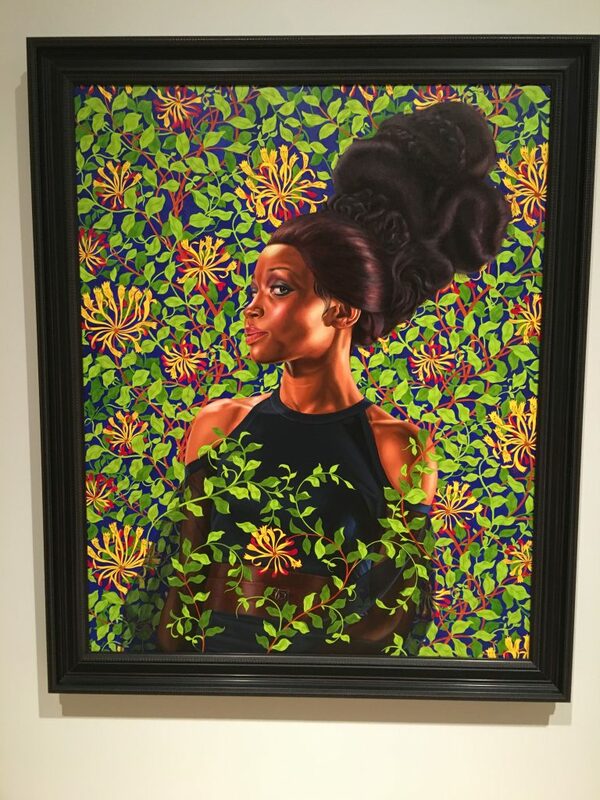 The MJ painting makes a great example: I stared at it for 10 minutes, marveling at the snail on the leaf, the huge armies tussling in the background. It was something to behold… but it also left a strange taste in my mouth, knowing that there’s a good chance most of this background work was done by Wiley’s team of assistants. To give the docents working the exhibition their due: They didn’t hide that fact when talking up his work. The docent I talked to briefly mentioned Wiley’s “outsourcing” before switching subjects to talk about how much of a genius he is. Considering my appreciation for people like Warhol, I can’t fault Wiley for the assembly line approach. But it did dampen my appreciation for some of the pieces a bit, wondering who was responsible for what. And also wondering why that question matters so much in the visual arts, when it doesn’t matter nearly as much elsewhere. Great albums and films are team efforts, sharpened and polished by the invisible hands of producers and technicians and session musicians: Why should paintings be any different? Speaking of Warhol: It’s interesting to think of the parallels between A New Republic and PAM’s last blockbuster show (devoted to all things Andy). Two large special exhibitions, devoted to gay men with distinctive/iconic wardrobes, who adopt an assembly line process to their artwork, who are obsessed with celebrity and immortalizing their own personal universe of Superstars. 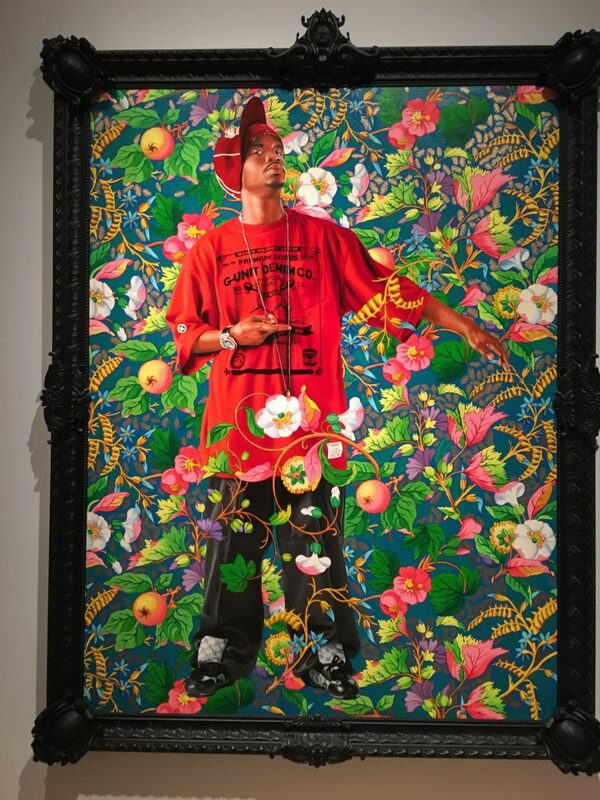 Warhol gives his subjects 15 minutes of fame via film loops and screen prints; Wiley does it the way Andy would have done it had he lived centuries ago: Through ridiculously decadent paintings. One huge difference separates the two exhibits: While the subjects of Warhol’s world were as white as an avalanche, Wiley’s subjects represents a wide spectrum of ethnicities. He’s painted subjects from all over the world, giving these classical court paintings skin tones and striking features that they’ve never had before. 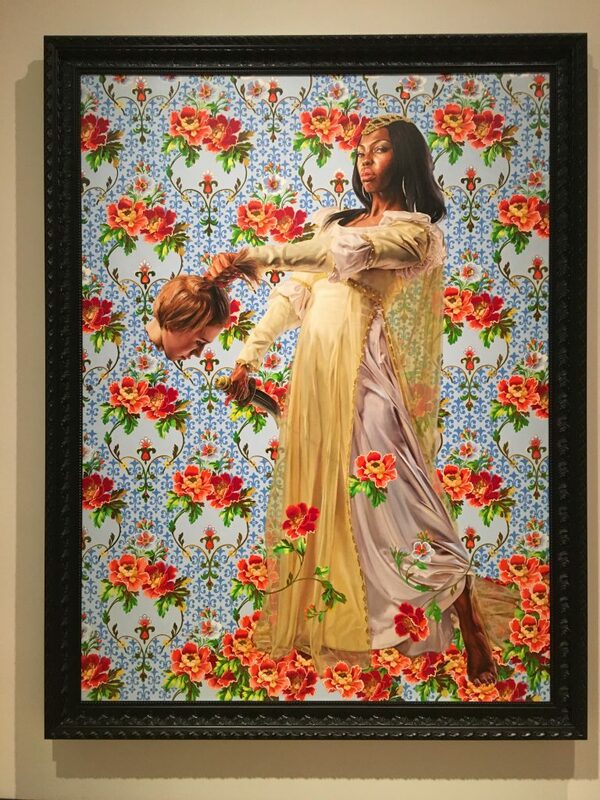 There’s only one white subject in the exhibition: The severed head held aloft in “Judith Beheading Holofernes”. I’ll be honest: Being in a space with virtually no white representation or perspective was… refreshing. One of the things that often doesn’t get talked about when we talk about privilege is that there can be a kind of… I like to call it “recognition fatigue”. Seeing yourself and your culture reflected back at you over and over again can be wearying, pandering, tiresome. It’s why I can’t watch Kevin Smith movies anymore. I grew up a fat white kid obsessed with Star Wars and Marvel comics; I don’t need to have that milieu, that culture reaffirmed for me. I know how I lived- I want to see how OTHER people live, what they’ve experienced. I know where I’ve been and where I’m at; I don’t need a reminder. For people who aren’t in the so-called “majority” (basically anyone who isn’t a straight white male), recognition fatigue is a luxury they don’t get to possess. Seeing your culture, your style of dress, your beliefs, your accent, your very existence acknowledged in any kind of media is powerful because it’s a rarity. Why not make Thor a woman, Captain America a black man, turn the Ghostbusters into women? We’ve had decades, centuries, of the alternative. Wiley’s work is upending centuries of that alternative. The stuffy, rarefied world of European nobility gets thrown upside down. The people who used to be exploited and killed and ignored by the original subjects of these paintings now get to live in their frames. The original subjects, those old white kings and queens and dukes and baronesses, have been evicted into the dustbins of history. Even if you can’t respect the man’s factory line approach and repetitious subject matter, his body of work can certainly be appreciated as a grand detournement. The man has hijacked and rewritten this entire vein of art history like Led Zeppelin did when they made millions off the back of obscure bluesmen. The copy has eclipsed the original. They’re even better than the real thing, as the whitest band on Earth would say. See how often Wiley’s work shows up, right alongside the originals? And how some of the pieces are the FIRST result? It’s not hard to imagine, assuming the human race doesn’t nuke itself within the next few generations, art history students of the future studying Wiley’s “Napoleon” and “Judith” and not bothering to gaze upon the originals that inspired them. Much like how a band might spend months obsessing over learning Zeppelin tunes without knowing or caring about their blues origins. The original fades, the copy remains. And if the nukes do fly, imagine what would happen if the feral wild children of tomorrow stumbled on a museum somewhere with Wiley’s court paintings hanging up. These melting pot nuclear kids would wander the halls, seeing these looming portraits of African and Hispanic and Indian kings and queens, and probably think that they were the rulers of the past. 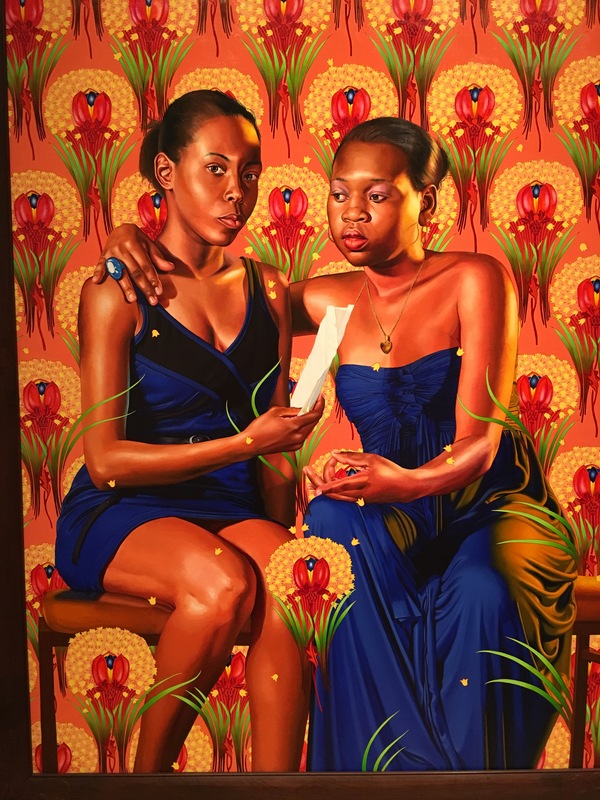 A modern audience can look at Wiley’s work as a giant What-If, a vision of a world where different demographics came out on top during the reign of monarchs. We look at these paintings and see what could have been. For the post-apocalyptic children of tomorrow, they’ll just see what was.